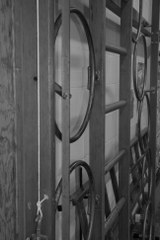 Every Primary School is given additional funding to improve PE and Sport for its pupils. 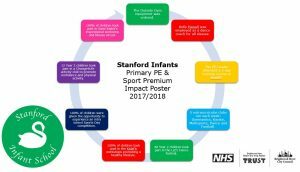 This page details how Stanford Infant School uses the Primary School PE & Sport Premium to improve the quality and breadth of PE and sport provision, including increasing participation in PE and Sport, so that all pupils develop healthy lifestyles and reach the performance levels they are capable of. The Department for Education (DfE) has guidance on the PE and Sport Premium Grant which can be found by clicking here. Our vision is for the children of Stanford Infant School to develop a lifelong love of sport, physical expression, fitness and activity. We promise that we will encourage the children to aspire for greater goals, challenge themselves and others and become respectful team leaders and members. Achieving personal excellence, pushing themselves to never give up and being inclusive team members are attributes that we hope our children will take with them through life. We hope that the children of Stanford Infants will leave us with a thirst for more! Welcome to the first addition of our Sports’ at Stanford Newsletter! Click here to view a copy now… more additions to follow soon. The Primary PE and Sport Premium doubled from September 2017, this was a straight doubling of the previous formula which has allowed all schools to be able to deliver further improvements to their PE and Sport provision. More information can be found here: https://www.gov.uk/guidance/pe-and-sport-premium-for-primary-schools. This is a superb opportunity to create and embed a culture of PE, Sport and Physical Activity in our school that can have a positive whole school impact and benefit pupils for years to come. Please click on the link below to view how we intend to spend the funding as well as on the impact it has on pupils’ PE and Sport participation and attainment. It will be reviewed regularly and published on our website.